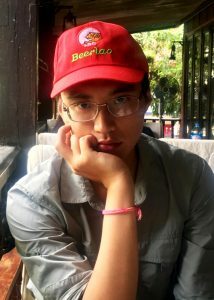 Weijian Meng is a PhD student of Linguistics at the University of Sydney, working under his supervisor, Professor Nick Enfield’s ARC Project, ‘Do language boundaries stabilize ethnic boundaries?’. His project is a reference grammar of Saek, based on a six-months fieldwork in the Nam Noy area that he conducted in 2018 and another three months planned for early 2019. 2016. Bachelor of Liberal Arts and Science (Linguistics). Honours Class I and the University Medal. University of Sydney. Meng, W. (2017). Word classes of White Hmong: a machine-learning approach. A paper presented at the 27th Southeast Asian Linguistics Society Conference. May, 2017. Padang, Indonesia. Meng, W. (2016). Classifiers and definiteness in White Hmong. A paper presented at the 2016 Australian Systemic Functional Linguistics Association Conference. Sydney, Australia. 2017. Zhuanglin Hu Postgraduate Research Support Scholarship in Linguistics. 2017. Language Training Initiative, Sydney Southeast Asia Centre. 2017. Postgraduate Research Support Scheme, University of Sydney. 2017. University of Sydney International Scholarship (doctorate). 2016. Arthur Capell Prize for an essay on Australian and Pacific Linguistics. 2015. Appen Butler Hill Prize for Excellence in Linguistics. 2015. GS Caird Scholarship in Linguistics, 3rd year. 2014. GS Caird Scholarship in Linguistics, 2nd year.